I have a requirement but i don't know how to implement it in circuit form. I require a circuit to switch on at a certain voltage and then follow that rising voltage. 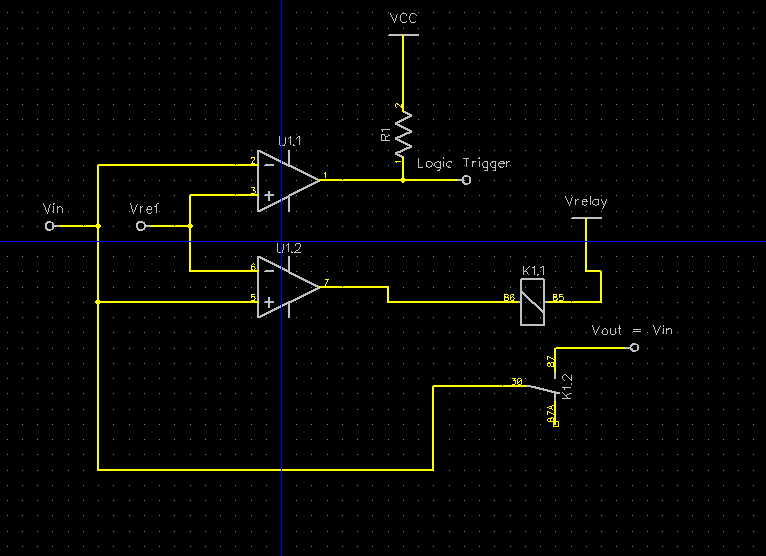 So i essentially what a comparator to turn on at 1V and then the output to follow the input from 1V to 5V. In electronics terms what is this circuit called? I'm not clear what you want. If so, I think a comparator and an analogue switch could do that ... ? try term clamp (clamping) or limiter, especially if you want the min voltage to be 1V rather than zero. Your description is not fully clear. You will likely be using opamps, not comparators for this!! I think that's the opposite of what he wants! I think he effectively wants what sound techs would call a noise gate. I think i need a comparator to turn on at 1V, then Vout to follow the Vin upto 5V. I am struggling on the Vout following Vin part upto 5V. * 0 - 1V (OFF)....means nothing, what voltage do you wanyt in OFF condition? As avrcandies says, that really doesn't clarify anything! So what about the idea of a comparator (to determine the switching point) and an analogue switch ... ? "analogue switch" could, perhaps, be a simple relay ? Yes an analogue switch sounds good, but i cant cant think of a circuit. Do you mean like a relay op-amp configuration? Note that "off" and "0V" are not synonymous! Do you mean like a relay op-amp configuration? Yes. That would be the 'Easy' way to go. Simply use a voltage comparator like an LM393(old yes, but it will work). It's dual comparator so use one of the two to control the relay, use the other for logic signaling. Vin to the other terminal and also connect Vin to the COM of your normal open relay. The other side of the relay contacts will now output Vin as you wish. How fast must the output voltage follow the input voltage? To take Jim's suggestion a step further, one could use an AVR with an ADC and a DAC, (e.g. XmegaE5, or perhaps the newer chips I'm not as familiar with), and in a tight loop just read the ADC input voltage and either output 0V or copy the input voltage to the output ADC. 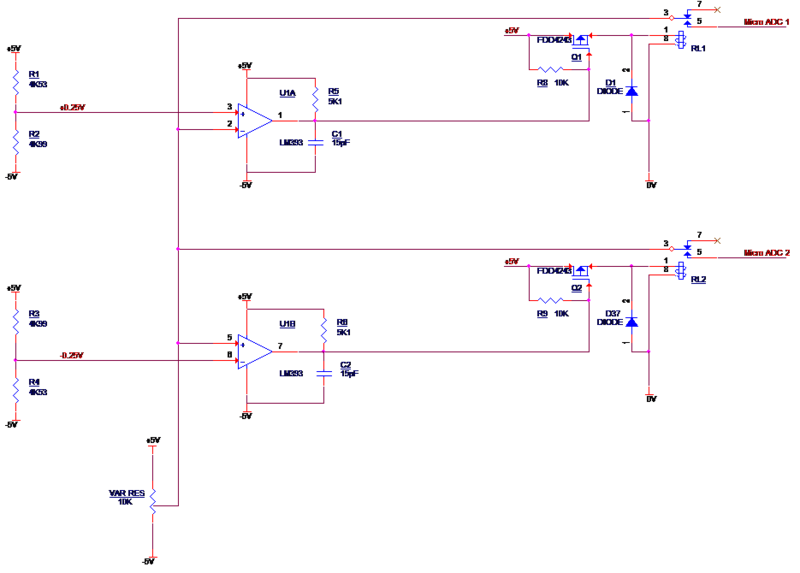 Easy, one chip, and one can change the threshold, either via a Pot on another ADC input, or via software. This setup would eliminate the mechanical contraption, (relay), and use less current than the relay option. The micro could run on its internal RC Osc, and would not require an external Xtal unless you needed the increased speed. I only really suggested the relay as it might be something easier for the OP to grasp. The original analogue switch suggestion does not have any mechanical contraption, (relay), and use less current than the relay option. And is simpler than a microcontroller! Easier is in the eyes of the beholder. I don't have any true comparators, or analog switches, on hand, but I have tons of small micros available. OP's choice, it is good to have options! It could be as simple as an LED. Below the forward voltage it doesn't conduct. Above it does. As for precisely 1V, then it may not be the best solution. It could be as simple as an LED. Below the forward voltage it doesn't conduct. Above it does. ??? I believe above 1V , OP wants Vout=Vin ...of course an LED has a varying Vdrop depending upon many factors. My vote goes to #13, it does what the OP wants. Looks pretty good, an open drain comparator (MIC7221) would likely be preferred, so it could pull closer to gnd, than the bipolar open collector . Here goes my effort, I still struggle on op-amps but I think this is correct. You've got a changeover relay, surely that will perform the switching between adc1 and 2 without having two relays and two comparators? The POT is a joystick left, stop, and right. Below is the logic. I am modifying an old machine and adding in some electronics. I have chosen 2 comparators to help with the stop (-0.25 to +0.25V) when the joystick is in neutral. Maybe I'm wrong but if there is e.g 1V at pot U1A+ > U1A-. So there is 5V at U1A output that goes (for what ever reason) into inverting amp that clamps it to ~0V. What opens Q1 and switch voltage into ADC1. At the same time U1B- > U1B+, what will put -5V into U1B output what will open Q2 and switch voltage into ADC2 at the same time as ADC1 is switched on. For -1V at input, Q1 and Q2 are off and both ADCs are disconnected. This doesn't seem to be what you want. After another study of the datasheet, i was struggling to understand the open collector part. I have changed the input wiring around and removed the inverting amp, so i think this should be correct now? After another study of the datasheet, i was struggling to understand the open collector part. In practice, open collector or open drain means the low output is the negative rail, while the high output is high impedance (disconnected) instead of the positive rail. What signal goes to adc1 when the relay is open? Likewise to ADC2? Why not put both signals to adc1 & 2 at all times? Perhaps a compatibility issue with the machine? Anyhow, your ADC probably does not use (or is damaged by) negative voltages...Is this correct? if not usable, get rid of them from your circuit!! Get rid of the relay and use something like a 74hc4066 or other switch. 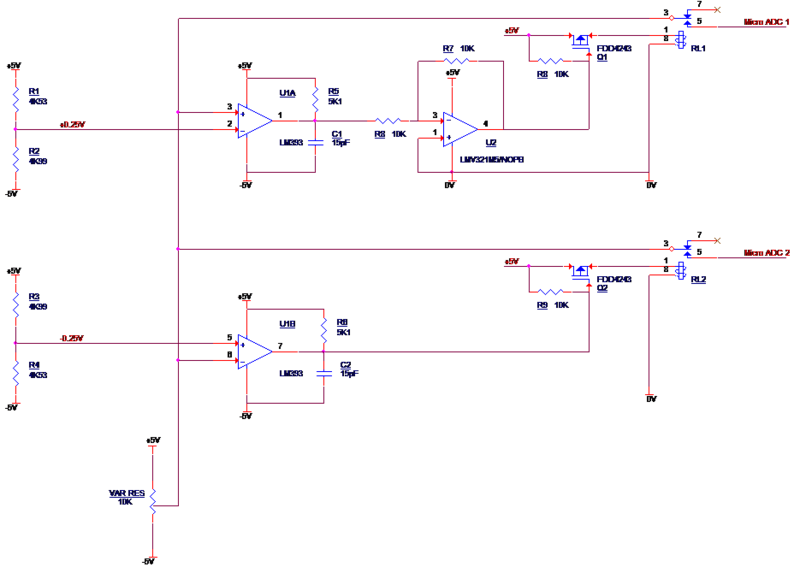 Otherwise, get rid of the fets , the comparator transistor can drive a small relay (say 15ma). A beefier LM311 can handle 50ma!! There needs to be a high ohm resistor from each comparator output to the + input terminal, or you will have chatter. If you need create just a "dead zone" for the joystick and you don't need exactly 0.25V, you may consider just use diodes. Schottky diode has about 0.2V drop across it and standard signal diode ~0.6V. Upper diode for positive and lower one for negative voltages. Diodes doesn't conduct (much) if voltage across them is smaller than drop voltage. Don't let things float...Take your diode suggestion and add pulling resistors to gnd...Then, below the diodes threshold voltage, the ADC will stick close to zero. Nor sure why the original poster is all of a sudden talking about negative voltages?? The first mention of negative was not til comment 22 !!!!!!!!!!!!!! The above pot/joystick control voltages are read into an Atmega324pa, but as I understand it this only reads ADC values from 0v-5v and not -5V to +5V (10v swing), so I thought the easiest way to read the pot data was to split the signal into two 5V signals, and put though two compactors and feed into two ADC channels. This ADC data will then will be translated into to motor control left, stop and right. I have the motor control part sorted, I am just struggling on the analogue input processing. 1) Out of the two solutions #26 and #27 which do you think would best suit my application. I can initially see #27 is easier to implement, but would this work as well as the #26 solution? 2) I always try to avoid using transistors because of thermal runaway and stick with FETs . Is this considered correct and the modern practice? But in your earlier thread: https://www.avrfreaks.net/forum/... it has already been shown to you how to convert -5V to +5V into 0V to +5V with a simple circuit that makes Vout = Vin/2 + 2.5V. You can feed that to the ADC and handle the dead zone in software. You are completely wasting everyone's time here, since you still seem to have zero clue about describing what you are doing!! You said these signals are going into some old machine, now your last post says they are going into a mega324??? What is the new part (you are creating) and what is the old part (that must be compatible)???!!? Is this some industrial machine? joystick to ResistorApin1. ResistorApin2 to resistorBpin1. resistorBpin2 to 5V. resistorBpin1 also goes to your ADC. Why wouldn't you use a divider in the first place? Also, why can't you wire up the joystick to simply provide 0 to 5V?